16thChestnut | Flickr - Photo Sharing! 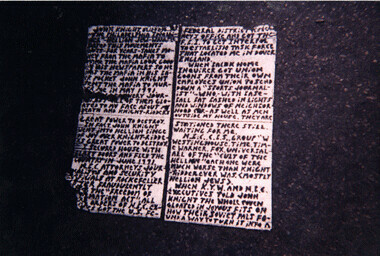 This is a photo taken in Philadelphia circa 1997 AD of the infamous "manifesto" tile. Tragically paved over sometime around 2001 AD. The photo does not do it justice -- this was quite LARGE... I would say maybe 2.5 or 3 feet tall and accompanied by two three color Toynbee tiles (with the standard message) which were equally large. JOHN KNIGHT, OWNER OF "THE PHILADELPHIA INQUIRER" - HELLION JEW - WHOSE HATED THIS MOVEMENTS GUTS - FOR YEARS - TAKES MONEY FROM THE MAFIA TO MAKE THE MAFIA LOOK GOOD IN HIS NEWSPAPERS SO HE HAS THE MAFIA IN HIS BACK POCKET. JOHN KNIGHT SENT THE MAFIA TO MURDER ME IN MAY 1991. (unreadable.....) JOURNALIST ALL OF THEM GLOATED TO MY FACE ABOUT MY DEATH AND KNIGHT-RIDDERS GREAT POWER TO DESTROY. IN FACT JOHN KNIGHT WENT INTO HELLION BINGE OF JOY OVER KNIGHT-RIDDERS GREAT POWER TO DESTROY. I SECURED HOUSE WITH BLAST DOORS AND FLED THE COUNTRY IN JUNE 1991. N.B.C. ATTORNEYS, JOURNALISTS AND SECURITY OFFICIALS AT ROCKERFELLER CENTER FRADULAENTLY .....(unreadable)..... UNDER THE "FREEDOM OF INFORMATION ACT" ALL.... ORDERS OF N.B.C. EXECUTIVES GOT THE U.S. FEDERAL DISTRICT ATTORNEYS OFFICE AND GOT THE F.B.I. TO GET INTERPOL TO ESTABLISH TASK FORCE THAT LOCATED ME IN DOVER ENGLAND. jbaij, xjohnpaulx, Ray Skwire, and 1 other people added this photo to their favorites. Whoa. Never even heard about this. So, all the tiles were placed by a ghost and a lama named Ned. Ding-Dong Ditch. Someone needs a shrink e dink!!!!!!!!!!!!!!!!!!! The Human Species is a lost cause. Someone hit the reset button. Suffocating in this cesspool of wasted potentional. Technology is the anti-christ. Tang is cynide. Free the pickles. wow, this menifesto on tiles. how to install tile on the right is suggested. Because improper installation can create a ceramic easily damaged, fragile, ceramic ballooned to fall off of the wall. Currently ceramics is still a favorite in building a house or Bangun rumah , a lot of things we should consider before choosing and installing tile in our house. Soya Sania It's not ceramic, it's linoleum. I think it'd be cool to install tiles in your house using pressure from car wheels as cars drive through your kitchen.... you'll want to make sure the floor is asphalt, and that you get plenty of direct summer sun in there, too!